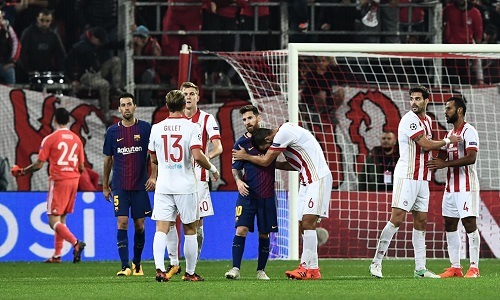 Barça and Olympiakos play to a goalless draw. The Greek hosts set themselves up to make things difficult for the Catalans who struggled to create much in front of a hostile atmosphere in Athens. This result meant that the Blaugrana remained group leaders after four games with 10 points, with Juventus behind them on 7 points. Barça will travel to Italy on November 22 to face Juventus but they will now shift their attention to the Spanish league when they host Sevilla this Saturday. Olympiakos: Proto, Ellabdellaoui, Botía (c), Engels, Koutris, Figueiras, Romao, Tachtsidis, Odjidja (Gillet, 74′), Mehdi Carcela (Pardo, 77′) & Fortounis (Djurdjevic, 83′). FC Barcelona: Ter Stegen, Semedo, Mascherano, Umtiti, Jordi Alba, Sergi Roberto (Deulofeu, 45′), Busquets, Paulinho (Rakitic, 61′), Denis Suárez (André Gomes, 74′), Messi (c) & Luis Suárez. Cautions: Tachtsidis (35′), Sergi Roberto (41′), Engels (57′), André Gomes (76′) & Figueiras (88′). Previous PostBarça defeat Athletic 2-0 to remain unbeaten. Next PostBarça battle Sevilla to a 2-1 victory.